While retaining the MLP structure, Enterprise Products Partners continues to highlight ESG priorities and more traditional financial metrics in an appeal to generalists. The company’s integrated Houston operations, including pipeline and storage assets, provide efficiencies for crude exports that management believes differentiates its terminals. Enterprise announced it has a $5-10 billion growth project backlog over the next three to four years, including petrochemicals projects expected to provide a diversified stream of revenue with the added benefit of a high barrier to entry. Last week, we attended the Analyst Day for Enterprise Products Partners (EPD) in Houston, which included a bus tour to the company's fractionation and petrochemicals complex in Mont Belvieu. Enterprise is widely considered a bellwether in the MLP sector as the largest MLP by market cap and a midstream trailblazer in some regards given its early adoption of equity self-funding and buyback authorization. Company management provided commentary on a wide range of issues, including the MLP vs. C-Corp debate, crude exports, petrochemicals, and other topics that have high-level implications for the rest of the midstream space. EPD to remain an MLP but highlights shift to "traditional financial model"
Even with the bulk of expected MLP consolidations and C-Corp conversions behind the space (read more), the MLP vs. C-Corp structure question remains in focus for MLPs, including EPD, which continues to monitor market developments. Company management provided the three key considerations for evaluating structure questions: 1) taxes, 2) the relative valuation of MLPs compared to C-Corps, and 3) access to capital. Management noted that operating as an MLP is not hindering the company's execution on market opportunities, and it is maintaining flexibility. While the structure question continues to be evaluated, the company is actively pursuing a more generalist-friendly traditional financial model through equity self-funding, lower leverage, buybacks, and distribution growth. EPD's presentation included environmental, social, and governance priorities, as well as free cash flow metrics and performance comparisons against the broader market and each sector of the S&P 500. These initiatives clearly reflect consideration beyond the traditional MLP or energy investor base and aspirations to attract generalist investors. With energy companies broadly trying to court and gain favor with generalists by focusing on returns and capital discipline, MLPs should do their part as well by making MLP investing more user-friendly. IDR eliminations, lower leverage, and more savvy capital allocation decisions are steps in the right direction, but progress can still be made for the space in terms of corporate governance, increased transparency, and a shift towards more widely used financial metrics. A key tenant of EPD's traditional financial model is its $2 billion buyback authorization, which certainly represents a reversal of the historical MLP model of issuing units. Company management noted that organic growth opportunities will remain the top priority for capital allocation, so buybacks will be opportunistic. Management noted that buybacks are not as tax-efficient as distribution growth for MLPs. EPD indicated that it would likely evaluate recurring returns to unitholders, including the distribution growth rate, early next year. 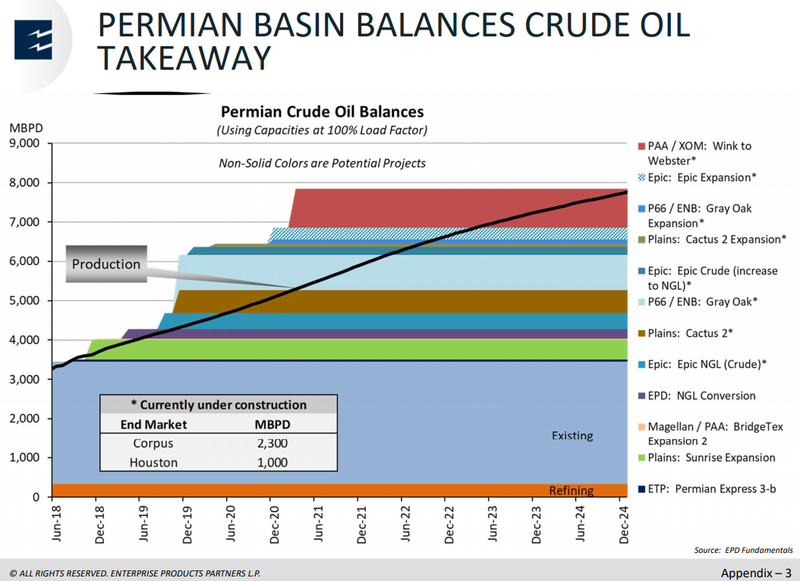 Given EPD's respected macro insights and its Permian exposure, management spoke in detail on the balance between Permian oil production growth and takeaway capacity, as well as the export opportunities related to production growth. As shown in the chart below, the company is forecasting an overbuild of oil takeaway capacity from the Permian that will last for three to four years from early 2020, assuming all announced projects get built. In its forecast, EPD projects Permian oil production at nearly 8 million barrels per day (MMBpd) by the end of 2024 - nearly double March 2019 production of 4.1 MMBpd. This production growth sets the stage for prolific export opportunities, though perhaps not every proposed project will get built (read more). For its part, EPD highlighted its access to 40 different grades of crude and 45 million barrels of storage in the Houston area as integral advantages for continued export success. With growing exports, Houston has become a more prominent oil price point (read more), as reflected in the company's partnership with CME Group on the WTI Houston Crude Oil Futures (HCL) contract. Management emphasized the transparency of the CME contract and EPD's ability to ensure crude quality as advantages, particularly given recent media reports of US crude being rejected by foreign buyers. 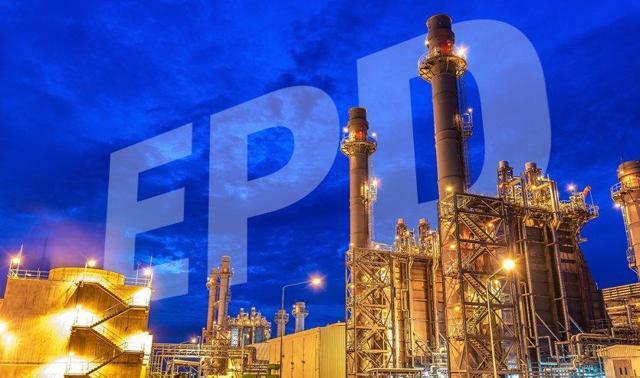 EPD expects to spend $2.9 billion in growth capital expenditures in 2019, with $6.7 billion of projects to be placed into service this year or currently under construction. In total, the company cited $5-10 billion of projects under development. Clearly, the fundamental backdrop of growing US energy production and EPD's existing footprint create plenty of growth opportunities, including in petrochemicals. Petrochemicals featured prominently in the discussion of growth projects. Petchem is expected to provide a diversified source of fee-based revenue with insulation from competition due to high barriers to entry. By 2025 or sooner, the petchem business is expected to generate $1 billion in gross operating margin from a little over $600 million today. To summarize, the petchem business is essentially providing midstream services to a different set of customers. Roughly two-thirds of Enterprise's petchem volumes are fee-based, and the remaining volumes are spread-based. As we discussed in our recent piece on petchem, EPD is leveraging its NGL value chain (see chart below) to construct a second isobutane dehydrogenation (iBDH) plant that will be completed in 4Q19, in addition to potentially developing a second propane dehydrogenation plant (PDH). Among MLPs, EPD is one of the leaders in terms of transitioning from the historical MLP model to a more traditional financial model, which should be welcomed by both generalist and MLP-dedicated investors alike. Aside from positive strategic strides, investors will be watching to see how the company executes its growth project backlog and capitalizes on the combination of market opportunities and its existing asset footprint. Michael Laitkep is an Energy Research Analyst at Alerian, which equips investors to make informed decisions about energy infrastructure and Master Limited Partnerships (MLPs). Mr. Laitkep seeks to promote understanding of the Alerian Index Series and support broader understanding of the role that midstream assets play in North American energy markets. Mr. Laitkep previously worked as an Investment Operations Associate at Capital Group in Los Angeles. Mr. Laitkep earned his B.A. in Plan II Honors and his B.B.A. in Finance from the McCombs School of Business at The University of Texas at Austin.